US equity indexes closed moderately mixed, sp +4pts at 2557. The two leaders - Trans/R2K, settled -0.8% and u/c respectively. 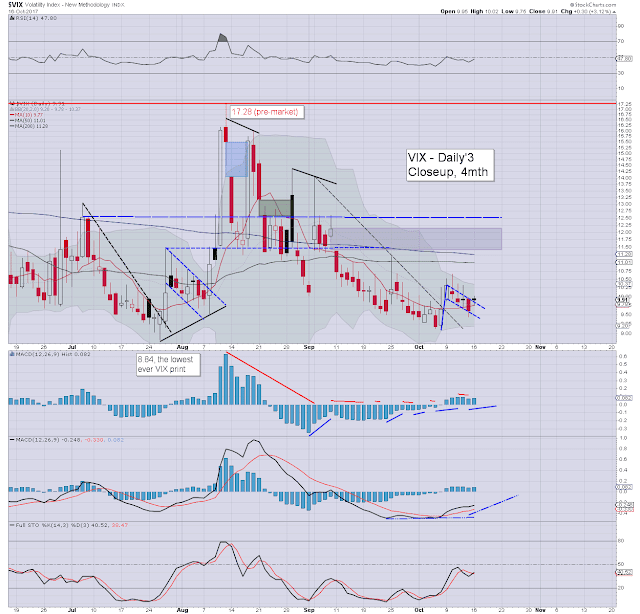 VIX settled +3.1% at 9.91. 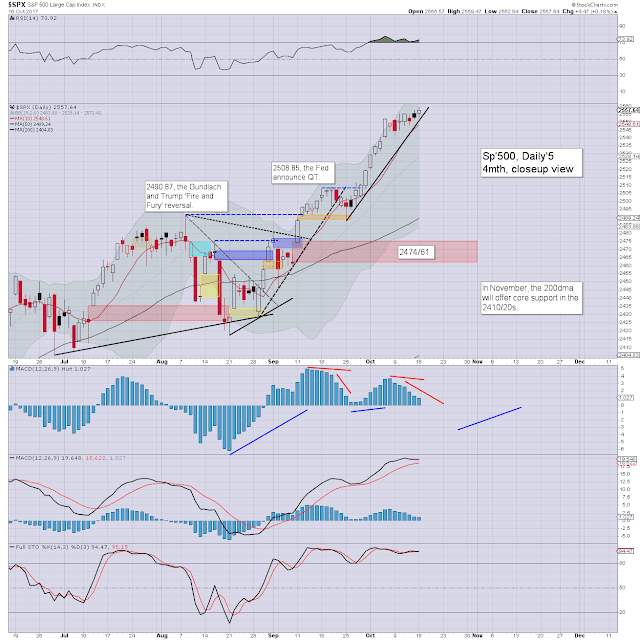 Near term outlook offers a long overdue sig' break lower, with prime target of sp'2474/61. Broadly, the US market is super strong, as the 2600s are clearly a given before year end. The week began on a positive note, with a trio of new index historic highs (sp', dow, nasdaq comp'). Price action across the last six days has been tediously narrow range, but still leaning to the upside. 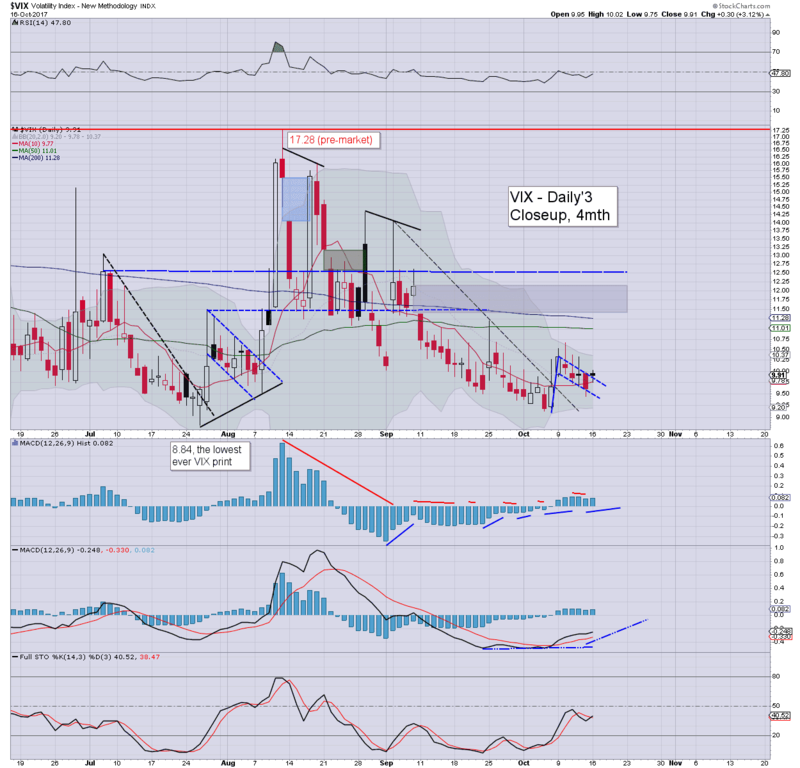 With equity strength, market volatility remains subdued, and despite the VIX closing net higher, that still made for a daily settlement in the 9s. Near term outlook remains unchanged. A sig' break lower is due. If the bears can't manage the sp'2520s by Thursday, then the 2600s could be sought before end month. Today is the 30th anniversary of the Oct'1987 crash. However, it really shouldn't be thought of as a one day event. The market peaked August 25th, and then saw an initial down wave of 8.7% into early September. Price action was choppy, but then leaned back upward into early October. 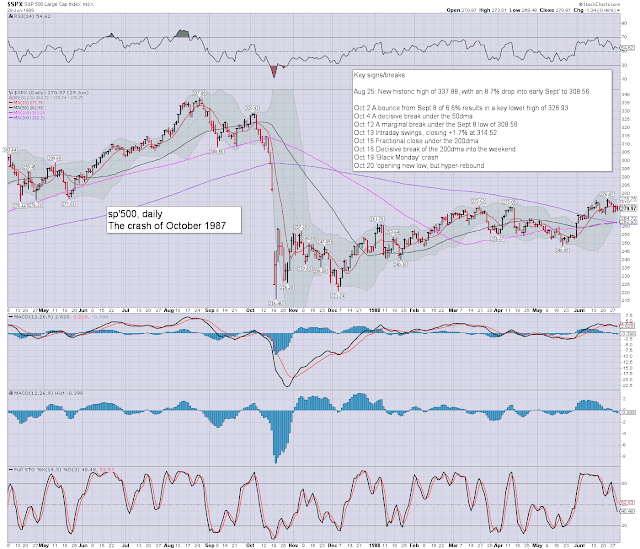 The Oct 2nd high of sp'328 made for a key lower high, and thus began 12 days of horror. Day 11 was 'crash day', but day 12 did see a lower low, but closed net higher. Back in 1987 yours truly was just 14 years of age (yeah, you can do the math on my current age). The previous Friday, the Southern UK was hit with a severe hurricane-strength storm, and its a curious thing that Hurricane Ophelia was nearing the British Isles just last night. I sure wasn't trading in 1987 (my first trade wasn't until 1990! ), but I remember the crash, as I was one of those weird teenagers with a deep interest in finance/economics. The US market soon recovered, but it really wasn't until 1993 that the UK market started to break new highs. Will we ever see a one day crash like 1987 again? Well, no, as the NYSE would freeze the market at -7%, -13%, and immediately shut the market on an intraday decline of -20%. Indeed, something I would look for in the years ahead is for the NYSE to tighten the circuit breaker limits. I see a time when the market will be shut on any daily decline of -5%. Many within the mainstream will of course support such trading restrictions/manipulation. I do not.